This is a sponsored post written by me on behalf of National Restaurant Association Educational Foundation for IZEA. All opinions are 100% mine. Pop Quiz: What do Lady Gaga, Michael Dell (of Dell Computers), Donald Trump, and Jennifer Aniston all have in common? Aside from being pretty successful in their careers, they all worked in restaurants at one point in their lives. I was a hostess at a restaurant for a few years while in college, and it was one of the best jobs I had at the time. Because of all the hours I put in, I was able to pay many of my student loans while I was still in school in New York City. While I am no longer in the hospitality industry, I can say that the lessons I learned during my times as a hostess still resonate with me. And I often find myself talking to people about my time as a hostess and why I always tip a server well. Honestly, I feel that working in a restaurant often gets a bad rep, and many people do not see how many benefits can actually come from giving this industry a shot. 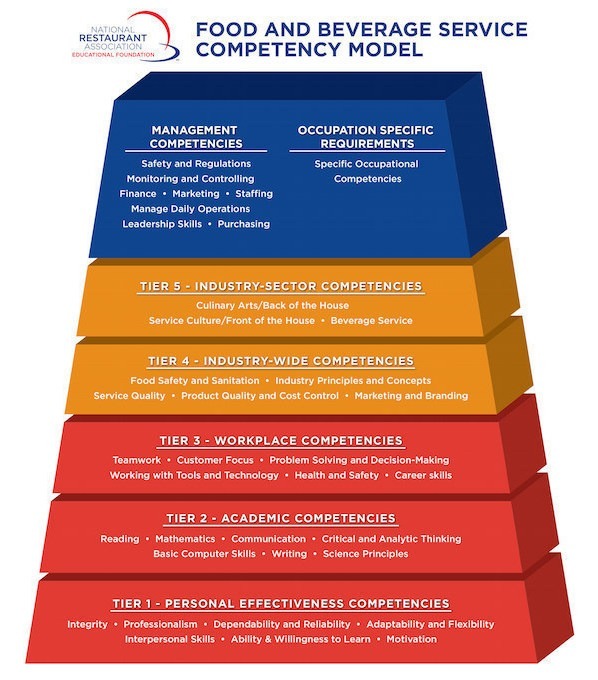 One thing I recently discovered is that the National Restaurant Association Educational Foundation (NRAEF) developed a Food and Beverage Service Competency Model—the first-ever competency model designed for the restaurant and foodservice industry. What the model does is make it simple for restaurants to employ new workers who have a shot at a long time career in the industry as well as competencies that can transfer to various jobs and/or life responsibilities. This gives anyone working in this industry a chance at a real world type of education that can jump start them in any career. Because of this, I want to share a few reasons why I think a job in a restaurant is something that all potentially successful people should try on. I remember applying to a job at a restaurant and was delighted when I was interviewed and hired that same day. The GM thought I knew I could conduct myself in a professional matter and gave me a shot! A cool fact is that the NRAEF offers one in three Americans their first job. So if you are worried you will be no good, just show up with your best foot forward. Even as a hostess I found myself in various roles. Sometimes I had to run a plate to a table, fix up the salad bar, or assure hungry customers that their table would be ready soon. Restaurant jobs offer a chance to learn employability skills like professionalism, teamwork, leadership, and time management. These skills can be transferred within the industry or to any job, and are quickly becoming important benchmarks during the hiring process. This is one thing I loved about being a hostess—I got paid every day and in cash. Yes, some paydays were a little short if people did not want to tip you, but I remember saving thousands of dollars in just one summer before I headed back off to school. Not to mention I knew some stellar servers that were making 50-60k a year. In the few years I was in the restaurant I saw servers become managers, my GM become a regional manager, and hostesses become servers. There always seemed to be a spot to move up, whereas in some industries the only upward mobility occurred if someone quit or was fired. However, I have found that this is also quite common considering that 86% of employees at table service restaurants and 85% of employees at limited-service restaurants say they have advanced to a higher-paying job in the industry. After being in a restaurant, you learn that everyone depends on one another. If a server is sick, everyone is going into overtime. So in this atmosphere you really learn how a business works and how important it is to have a great team. I believe I have gained some skills that I have used and applied to Miss Millennia Magzine. According to the NRAEF, 8 of 10 employees and 9 of 10 owner/operators believe the restaurant industry is one where people of all backgrounds have the opportunity to own their own business; a majority say they would like to own a restaurant. There are many reasons to consider a career or job in a restaurant and I feel that it is an industry that is filled with proud and hard workers. So to everyone I say give it a shot and see how you like it. Donald Trump did, and now he’s a billionaire. Just saying….